INSIDE WHEEL WELLS 81", TRAILER WITH BEAVERTAIL, FOLD DOWN RAMP AND SIDE ACCESS DOOR. ELECTRIC BRAKES REQUIRE BRAKE CONTROLLER IN TOW VEHICLE FOR OPERATION. 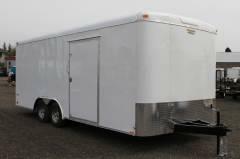 * Please call us for any questions on our trailer enclosed 24 foot van body car haul rentals in Portland OR, Gresham OR, Milwaukee OR, and surrounding metro area.